Some things require practice, some things require evolutionary leaps through time. Other things are born seemingly perfect, and never cease to amaze as they continually improve – generation after generation. iPods would be a good example of the latter, the Hilton family would not. When it comes to four-door automotive bliss, BMW’s M5 has stood as the industry benchmark since 1985. It has never wavered from its perch of dominant performance, overlooking all other competitors as they stretch to touch the bar it continually sets so impossibly high. So as you can imagine, improving on a car founded at such great heights is no easy task. Many would say that BMW’s E39 M5 launched in 1999 was the holy-grail of M5s; that it was so inviolably good, no car could ever de-thrown it. Of course, many cars have moved the performance bar since then including the American built CTS-V (shocker! ), not to mention the E39’s own family descendant, the E60 M5. This should not be surprising to anyone with their eyes open, because technology advancement has catapulted car design at warp speed to where we stand in the fall of 2011. That Cadillac was able to build a car even worthy of comparison to an M5 is testimony to the rapid advancement of automotive design in the modern era, across all continents and companies. With the above in mind, perhaps it should come as no surprise that the fifth descendent of the M5 is a techno-packed marvel of wires, exotic metals and blurry performance. 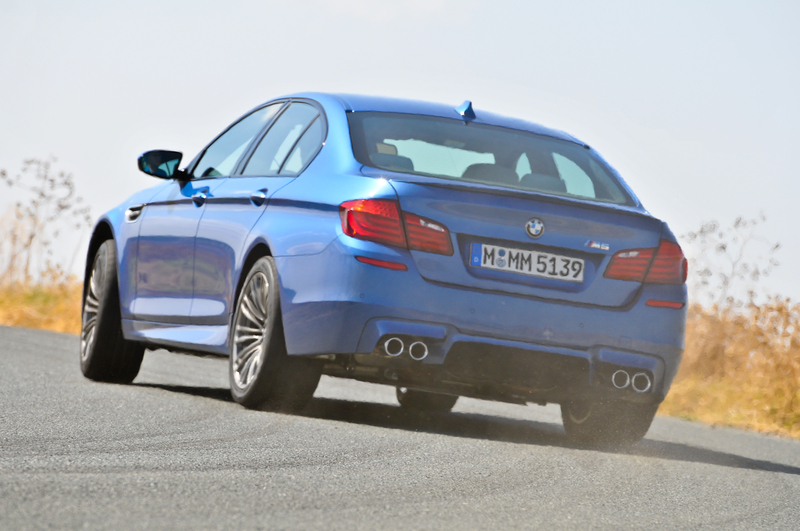 BMWBLOG has already documented the new M5’s performance as a track day weapon. We’ve also driven around Ascari looking mostly out the side windows, for your reading enjoyment. Today we bring you a review of BMW’s M5 as it performs on public roads, albeit Spanish back roads and (heavily Policed) highways. Finally, the moment had come. I found myself with arm-outstretched in anxious receipt of the key to a shiny new M5. The corresponding car to my key was found outside the hotel in a parking lot flooded with fellow M5s. Walking up to my copy, I noticed the bulging wheel fenders and gaping intakes. These will stick out from the crowd – except when in a crowd of M5s. Slipping in behind the wheel, I adjusted my seat and mirrors. And the steering wheel position. And the seat bolsters. I suppose I was letting it all soak in before that special moment. “Munich: we have ignition.” The M5 was alive, and after a surprisingly audacious song of revvs, the twin-turbo engine settled into a sonorous hum. Palms now sweaty (it’s hot in Spain) I adjusted more buttons. Two buttons were of particular importance to my recollection: M1 and M2. When I first heard of the new M5 featuring two M buttons I thought, “what gimmickry!” Why not three or four? Maybe five? But it wasn’t long before I appreciated their presence on the thick rimed steering wheel. “M1” was set for maximum fun, with the suspension, engine and steering in their sportiest settings, and all electronic nannies turned off. “M2” was set for the polar opposite driving experience: relaxed steering, suspension and engine response – all ready to calm the mood after turbocharged blasts. Setting off for a photo shoot, I found myself navigating the route to a desolate back road. M1 engaged, (you must press the button twice for fear you hit it accidentally), I let this animal off its leash. Let’s be clear: this new M5 is a raving lunatic of power and speed, if that’s what you allow it to be, by hitting M1. I’m no longer sure if M stands for “Motorsport,” “Maniac” or “Monster,” but it sure as hell doesn’t stand for “Marketing,” as some antagonists would have you believe. 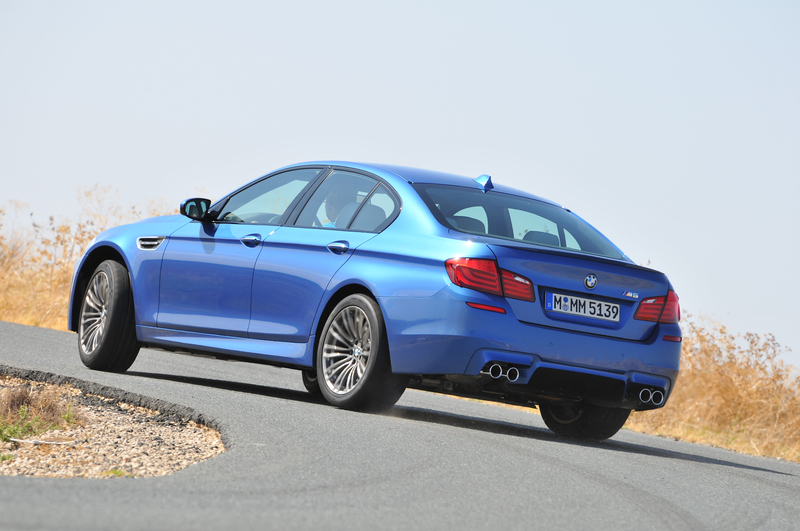 Scampering over the asphalt searching for grip, the M5 felt very alive and giddy to play. Throttle response was immediate, if not completely lag-free (as physics would suggest that this is completely impossible). Lag was only felt in the higher gears, in first and second it was nearly imperceptible. 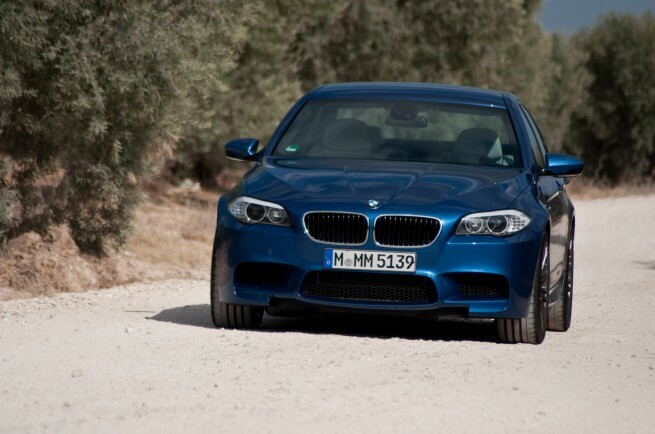 The truth is, this first-ever turbocharged M5 builds character and personality on the addition of its turbos. It doesn’t apologize for them, and neither should BMW M. The turbos add so much to this car – besides its 5,000 rpm wide full-on powerband. They add a whooshing, sometimes hissing, mostly thunderous soundtrack. They give this car the muscular, torqued up personality that was lacking in the E60. And – save the planet – they add 30% efficiency over the fuel consumption of the last M5. Overall, the power-plant is what defines this car, and in my opinion, the turbos are what make it truly great – and relevant in the year 2012. Lag has been reduced thanks to several key changes to the S63 twin-turbo unit found in the XM cars, from which this engine was based and shares most parts. A drop in boost pressure of 0.1 Bar helps minimize lag, as does the addition of Valvetronic variable valve lift on the intake side. The intake valves are now used as throttles, for the first time in an M engine. The S63tu (technical update) engine in the new M5 still has throttles fitted, but they only kick in when called upon in “Limp Home Mode,” should there be a technical failure in the valvetrain. 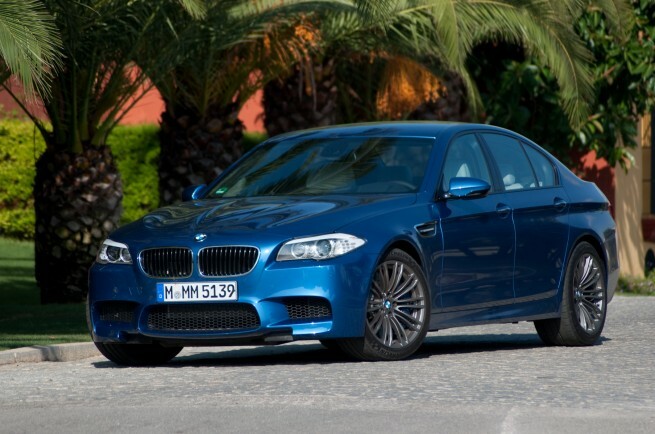 The M5’s engine was also updated with larger turbos, and intercoolers approximately twice (!) as large as those found on the XM cars. Piping in and out of the engine has been significantly increased in diameter, thus allowing better flow. No less than six radiators are found lurking behind the front grill and plastic fascia, with the bottom most radiator laid flat horizontally to double as an aerodynamic element to guide airflow into the car. You get the feeling that the cooling system alone is a technological marvel – and considering that the turbos and catalytic converters are crammed in the 90′ ‘V’ of the cylinder banks, there is no doubt that the M5 needs this level of cooling power. 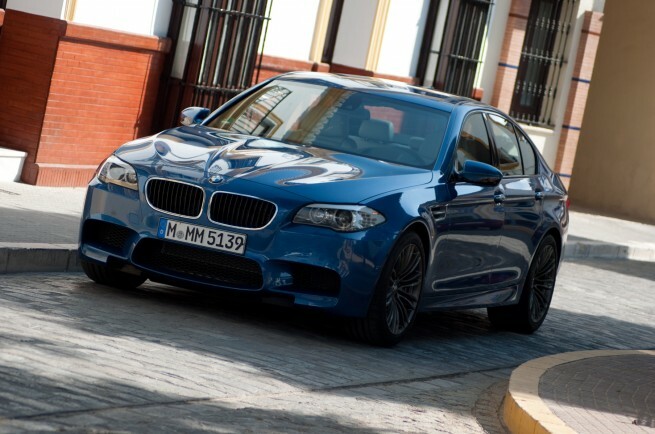 Already impressed by the dynamic performance of the M5, I decided to queue the music, press “M2” and calm the drive. The widened variance between performance and comfort settings make the F10 M5 a uniquely two-part car. Driving to the office, or driving grandma to the optometrist would not feel out of place in this car. In its comfort settings, it is softly dampened to the point that most bumps are minimized or swallowed up altogether. Steering feel is still communicative of the road surface, but more assisted and a little less raw. The engine and transmission show the greatest difference, providing very smooth roll-on throttle actuation while pulling away from red lights. The Getrag sourced 7-speed dual clutch transmission holds gears only long enough to justify the next upshift, and then completes the shift in soft, luxurious, nearly slush-box smooth style. One of the biggest improvements over the E60 M5 would be the addition of huge torque reserves low down in the rev-band – particularly in the context of relaxed driving. Left in automatic drive mode, the M5 can be driven in a spectacularly boring fashion. We know that deep inside, its turbines and cylinders are gritting their teeth – anxious for the next tire spinning adventure – but this new M5 will try hard to fool you into believing it is a pedestrian beast of burden. Whilst basking in the lush and luxurious cabin of the new M5, “M2” mode firmly affixed on the dash, I came upon a round-a-bout. They are common in Europe and really no big deal for European cars since – unlike American cars mostly designed to travel in straight lines – European cars are designed to turn on occasion. Half-way around the circle, in my coddled and relaxed stupor, I stepped on the gas. Shortly thereafter, I found my hands a-flutter going opposite lock, my foot feathering the throttle to bring the car back straight. Jumping junipers! In my infant moments with the car, I had overlooked the fact that in my M2 preset, traction control and dynamic stability control were both turned off. The driver of the M5 ahead of me later confessed that he thought I had intentionally drifted through that round-a-bout – but trust me – I did not. This experience shed light on a valuable observation. The E60 didn’t want to kill you, and this new one does if you turn off the electronic aids and don’t know what you’re doing. So to that end I think the new M5 shows a big improvement, because by most definitions, this murderous personality makes it a true supercar. If any ‘Ol Joe could hop in and drive its wheels off with ease – well you wouldn’t garner much respect driving one, as you would a typical “tries to kill you” supercar. Of course, leave the dynamic traction control on, and the M5 will do you no harm – as long as you respect a few basic laws of speed and physics. But no one will assume your first name is ‘Joe’ because of what this car can do, and ultimately wants to do to you. Like a dirty girlfriend, it always wants to play naughty, and speed limits not withstanding, it could get you in a lot of trouble. This is precisely what draws most buyers to such a car. It’s fun to be naughty, and driving a naughty car says a lot about you. A few points can be added to your cool factor. You may claim the “Cool Dad” title. You might even add a few facebook friends. At the end of the day, you always end up back in M1. It’s just so addictive. 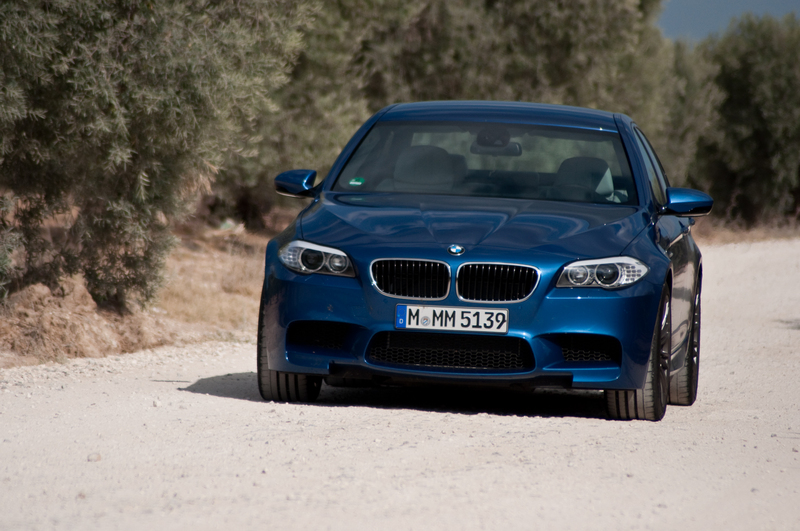 Finally arriving on open, curvy Spanish back-roads, I had my first taste of the M5’s performance depth. Tromping on the throttle from a standstill, the rear slightly squats down as the tires spin and hurl you forwards. Car and Driver has claimed a 0-60 time of 3.8 seconds using launch control, and our well-calibrated neck muscles tell us that’s no lie. Up to redline in first, I tapped the right steering mounted paddle and grabbed second. Wheel spin. Grabbed third. Wheel spin. Grabbed fourth. Good lord… a little wheel spin. True, the Spanish roads were a little slippery in some places, but still – this engine is hydrogen-bomb powerful. It gives you the impression it could pull forever, and I suspect that it could push the M5 well beyond the 200 mph barrier with the right gearing. If the E60 M5 could break 200 mph once delimited, then certainly this car could turn a four-door shattering top speed closer to 210 mph. I would place that wager. Carving through the sweepers, the chassis feels incredibly stiff, and the suspension tightly bound. Upon reaching a particularly bumpy back road, I found another handy use for the second M button on the wheel. I lost the comfy settings and instead programed “Sport Plus” in every parameter except the suspension setting, which I left in “Comfort.” The resulting interplay between road surface, M buttons and road holding was incredible – as I hit a bumpy stretch I would engage M2, then once the road smoothed out, I’d switch back to M1. Over the uneven asphalt, comfort mode allowed the wheels to maintain good contact with the road, whereas the sportiest setting had me skipping across the surface. Needless to say, after several back road blasts, I grew to love the additional M button. Steering feel is excellent, if not perfect. It demonstrates a massive improvement over the pedestrian F10’s steering, but I could use a little more feel at the limit when feathering the wheel, feeling for grip. That aside, the handling is top notch and gives you a lot of confidence to press on. Still not buying our testimony of handling prowess? Check out the photo above and zoom in on the inside front tire. Only a dialed in suspension, chassis and tire setup can produce enough grip to lift the inside wheel. The brakes are massively powerful, hauling the M5 back down to speed in short order. Thanks to venting, cross-drilled rotors, and massive 6-piston front calipers, the brakes were consistent and fade free. Overall, my biggest complaint would fall in the weight department. It’s not that the M5’s considerable heft is a major hindrance to its performance – in a straight line or around the track. M engineers have compensated for the weight increase brilliantly, and shy of 10/10ths driving, it’s a moot point. 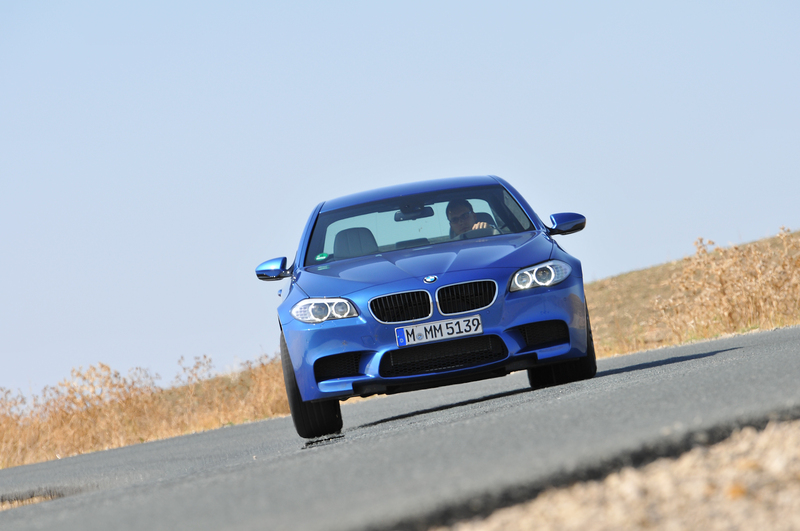 But the weight is felt nonetheless, and it is without a doubt the new M5’s weakest link. To phrase it another way, if the M5 lost 253 lbs instead of gaining them – it would be that much better, more tactile, quicker on its toes, and eager to change speed and direction. To be fair, the new M5 is larger than its predecessor, so factoring that in, we can still consider it to be “light weight,” even at 1,870 kg (4,123 lbs). 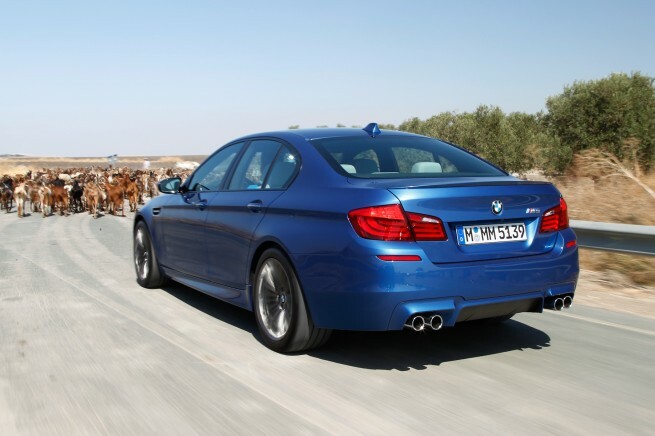 Many individual components on the M5 are lighter, including the engine, and the doors – now made of aluminum. The usual BMW appointments of luxury and technology fill the cabin, from iDrive to a fabulous sound system. The seats are a pleasure to sit in regardless of duration, and when you’re not flogging it, the cabin is relaxed and quiet. In typical BMW form, every control falls to hand and buttons are exactly where you would expect them to be. The only thing missing was a third pedal, but we hear even this appendage will make its way to showrooms in due time. Finally and in conclusion, we arrive at the topic of curb appeal. I challenge you to walk past the new M5 and not feel your heart beat just a little bit faster, or your eyes lock onto its curves. Its sheet metal is muscular and menacing, yet swoopy and curvaceous. 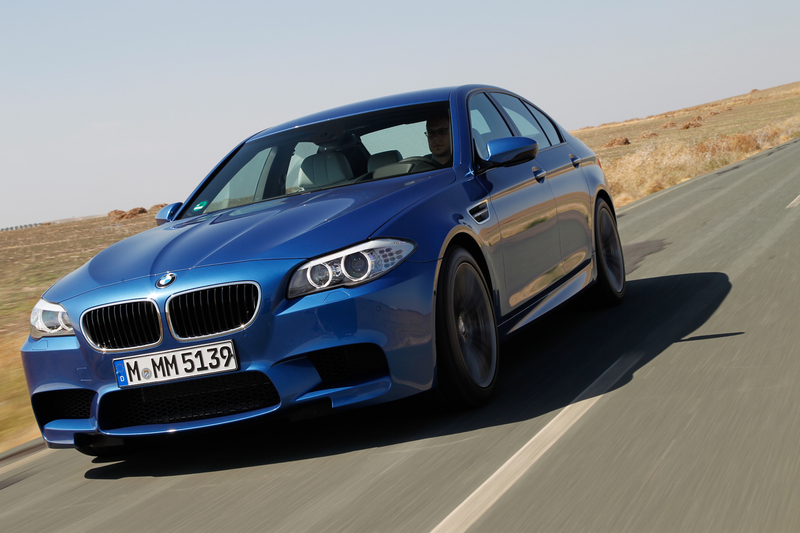 Now in its fifth generation, the M5 is packed with charm. It became clear to me while driving through a small Spanish town that the M5 has street presence. It turned heads, first for its sound, then for its looks. I believe its gorgeous sparkling blue paint may have also had something to do with it (or perhaps its handsome driver? No, most certainly not!). I heard a young girl yell, “Muy bonita!” translated, “Very beautiful!” while driving past. Men and women of all ages could not help but lock eyes on the slippery blue shape as it rolled away. The M5 seemed to enjoy the attention, because it rather rambunctiously revved its engine every time the auto start-stop technology would switch the engine back on. After a large enough crowd of young men had gathered their attention, the least I could do was tromp on the throttle – much to their fist-pumping, cheering delight. This is a happy car – it wants to take in the moment. It often makes you smile. And for that – it can fittingly be badged an M car. Muy bonita indeed.